We were joined by Dr. Raza Awan, medical director for Synergy Sports Medicine and Rehabilitation. He gave an overview of the epidemiological research he has begun with the yoga injuries that his clinic has been treating over the last several years. Diane shared a personal account of her 20 years of dedicated practice, and how injury has led to innovation. I nervously presented some preliminary themes from my own research, based so far on over sixty interviews. Kathryn Bruni-Young spoke on her transition from vinyasa-only practice to the more eclectic (and, she claims, healthful) mix of strength and movement disciplines she engages with and teaches today. The main part of the three-and-a-half hour meeting featured an open and wide-ranging discussion. Participants shared concerns, some injury stories, and general feelings about the state of asana education. We’ll be publishing several clips from the evening over the next few days. Here’s my bit. Because it’s over 30 minutes long, and we’re all very busy, I’ve summarized my central points here, along with a few clarifications (which I’ll present in parentheses). — There are many themes emerging from my interviews so far. 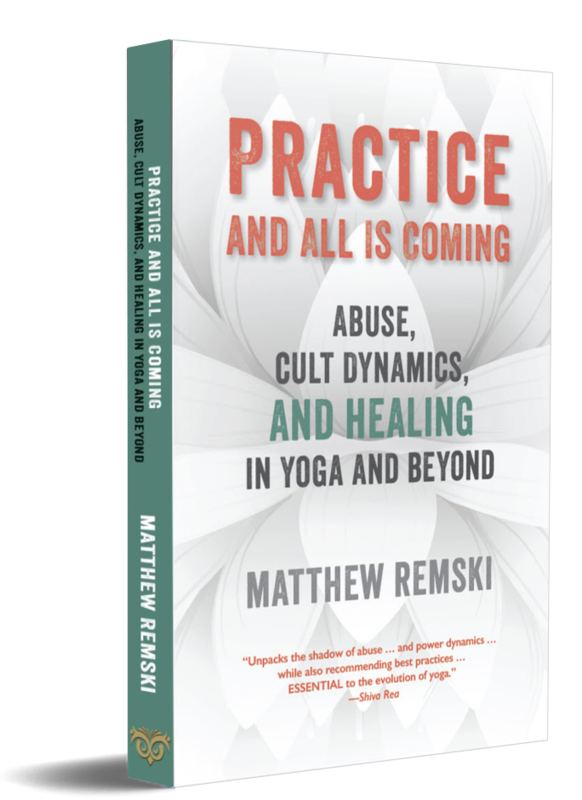 Here’s a grab-bag of categories that describe the psychological, pedagogical, and sociological contexts in which yoga injuries occur. Some of this material might be triggering. — Spiritualization of pain, or, the “pranic model of injury”. This involves rationalizing discomfort, pain, and even injury as an inevitable part of spiritual growth. (This may or may not be true according to one’s commitments, but assuming that it is true can dissuade people from learning how to be more safe-smart in practice.) The pranic model of injury suggests that tissue damage might be a sign of a “reorganization” that will allow prana to flow more freely. Paradoxically, injury can then be seen as a sign of healing. The pranic model of injury does not map onto any biomedical understanding of injury. — Prior conditioning that encourages compliance. Some practitioners report that they were acclimatized to accepting harsh adjustments from teachers because they had been trained toward self-sacrificing compliance in prior disciplines, such as sports. — Physical abuse/corporal punishment softening students up for harsh adjustments in postures. Reports of teachers slapping students for failing an alignment task or not paying sufficient attention. This can create an atmosphere of inappropriate compliance to teachers who are overly assertive. — The dedicated practitioner who severely injured her shoulder doing intensive arm balances. She continued to practice, believing along with her community that practice would improve the condition. When she could afford an MRI, her physician examined it and advised that she stop. — The former elite athlete who accepted a harsh adjustment because prior training had prepared her for this. The adjustment injured her severely, but her instinct was to blame herself. — The philosophy and religious studies student who took up asana in a quest for mystical experience. He reported that “I continually had the idea that the flesh was illusory, but that there was this amazing healing ability connected to hatha yoga that whatever pain that would arise would be cured through mystical states.” He practiced through substantial lower back pain, which lingers into the present. I concluded the presentation by referring to how many of the subjects I’d interviewed so far had been able to utilize their injury experience to innovate more functional and therapeutic approaches to practice. The happiest part of this research is in seeing how asana pedagogy is experiencing a surge in creativity in response to the last century of methods that may have fallen short of the promises of yoga. However, harnessing that creativity into a set of better and more actionable standards than those currently in place will be an enormous challenge. Yes! Matthew, keep up the good work. I am so looking forward to your book on this. Very insightful research, thank you for sharing. I value this work and look forward to your future publication as well. At the same time, for the sake of argument, I wonder about your cynicism toward faith. The quote you offer in the video, that faith is the pretending to know what we do not, is quite reductive and a narrow filter through which to interpret all this fascinating qualitative data. I think there is a difference between inventing paradigms for sublimating pain, which strikes me as absurd, and being open to the possibility that the practice is operating on us in a great many ways, while we may only be consciously aware of a few of them. I guess I’m trying to say, perhaps we can distinguish between faith and self-delusion, and to flippantly superimpose those concepts may lead to more obscurity. This is a minor note in the larger project here, and I am thrilled to see you deconstructing problems of power relationships and psychology within student-teacher-community networks. I’ve already benefited from your work here. Adam, I agree with you, and in the future have to make the distinction between the cultural critique usage of Boghossian’s very harsh definition, which I employ to disarm the polyanna overreach of yoga marketing, and the more intimate feelings and economies of faith. The task is complex: on the one hand I want to confront faith-based claims, but on the other, I really do want to understand and value those unnameable impulses belonging to softer understandings of “faith” that drive practice and the self along. The real difficulty is in telling them apart, and I appreciate how your thoughts will sensitize me to this. I see another issue not exactly covered in your list ( which I recognize is not intended to be exhaustive). I see practitioners who use yoga in an addictive fashion to treat mental health issues. Thus the ashtanga teacher who wrecks her knees doing jump thrus and won’t give them up because this yoga brought her out of a deep and long- standing depression. Or the teacher who has replaced substance abuse with vinyasa or bikram. Certainly yoga is a great way to move thru or out of mental health and substance abuse but the method and attachment to a particular practice can be injurious. This was very insightful and compassionately presented! I enjoyed the entire 30 minutes!